The Marvel Cinematic Universe is gearing up for some huge changes over the next few years. Avengers 4 will close out the current phase of the MCU and usher in an era that will put an end to some of the most beloved superheroes of all time. That means that we're going to need some new heroes to take over, which is where Captain Marvel comes in to play as well as Black Panther and Guardians of the Galaxy. Now, Kevin Feige has confirmed that there have been talks about bringing Ms. Marvel to the MCU. In a new interview, Marvel Studios boss Kevin Feige revealed to BBC Arabic's Husam Asi that Ms. Marvel is in the works and could very well go into development after the release of Captain Marvel. Feige stated that the project is "definitely sort-if in the works," which is a weird way of putting it. However, this is huge news for fans of Marvel Comics. Feige had this to say. "We're doing Captain Marvel right now. Captain Marvel's shooting right now with Brie Larson. 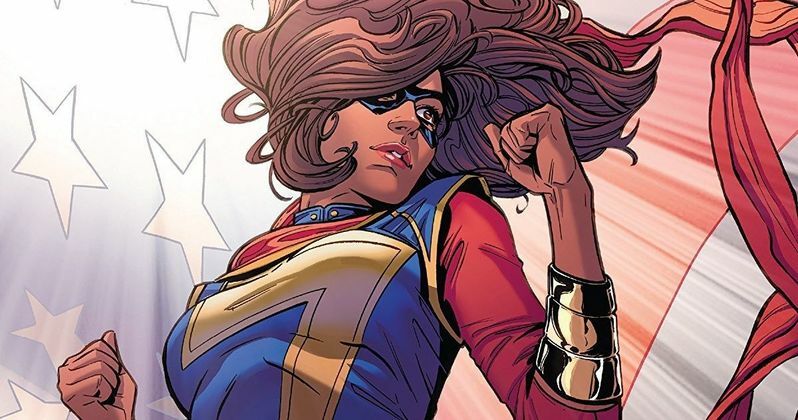 Ms. Marvel, which is another character in the comic books, the Muslim hero who is inspired by Captain Marvel, is definitely sort-of in the works. We have plans for that once we've introduced Captain Marvel to the world." Kamala Khan, aka Ms. Marvel, is a Pakistani-American fan-favorite character from Marvel Comics. She was first introduced in 2014 as a result of the Inhumans' Terrigen Mists being released. In turn, Khan received her shapeshifting powers that she in best-known for. She can stretch her limbs to incredible lengths as well as grow or shrink to incredibly small sizes. Carol Danvers, aka Captain Marvel is Kamala Khan's biggest inspiration. There's a lot of buzz around the Captain Marvel movie, and not just because it helps to set up the events in Avengers 4. The movie, starring Brie Larson, is rumored to be a game-changer as well as a film that changes and revolutionizes the comic book movie genre as a whole. Now, these are pretty big claims, but if true, they could go a long way in setting up the MCU for the arrival of Ms. Marvel in the near future. Related: Ms. Marvel Movie Filming Next Year? For now, the MCU has Ant-Man 2 up next, hitting theaters in July. Captain Marvel will be released on March 8th, 2019, which is only a few months before Avengers 4 will be released. And Avengers 4 is the big one that fans are speculating about the most. How big of a role will Carol Danvers play in the movie? If any of those recent reports are true, she's going to have a pretty large role to play when Avengers 4 hits the big screen. Hopefully some more news about Ms. Marvel is released soon, but until then, you can check out a video of Kevin Feige talking about the project and where it fits within the MCU below, thanks to the BBC Arabic Twitter account.